Several years ago, I attended my second National Speakers Association Annual Conference. My objective for attending was to rub shoulders with successful speakers and take away a handful of ideas to jump-start my speaking practice. Hence the first evening, I stopped at the lobby bar for a beverage and a bit of mingling. I very much wanted an expert opinion on a theory that I’ve long held: An organization that builds and executes an effective brand brings additional margin to the bottom line. Of course, I already knew the answer, “Yes.” But Chris said, “No.” So, I bought him another drink. Let’s back up and lay some groundwork. You’ve likely seen marketers and brand experts trot out Starbucks, Apple, Coca Cola, or Target as examples of well executed brands. And, many large multi-national organizations do track their specific brand equity. In fact, the firm Interbrand tracks brand values and the associated changes in brand value from year to year. As an example Coca-Cola retained the No. 3 position on Interbrand’s esteemed annual ranking of most valuable global brands for the second consecutive year. Coke’s 2014 brand value is estimated at $81.6 billion, up 3 percent from 2013, more than four times that of the nearest beverage brand on the list. Many advisors and small business owners don’t have the necessary capital and staffing to compete on a global level and therefore likely have zero brand equity to discuss during the sales process. Hence, Chris’ answer. Because a well branded organization increases the perceived value of their services. Unfortunately, many local and regional advisors neglect their brand. They see their brand as simply a logo slapped on a business card, brochure and website. Your brand encompasses the full experience your prospects and clients have with you and your firm; from how you answer the phone to the quality of your business card and everything in between. Your brand can be an intentional piece of your business development effort. As an example, we recently redesigned the ShoeFitts website. It was the third iteration in as many years as we have been in business. The ShoeFitts Creative Crew expanded the use of the pimento red color specifically to imply sophistication and power. Now we are evaluating our client onboarding and welcome process because first impressions last forever. In fact, we have an ongoing audit of our brand and client experience. 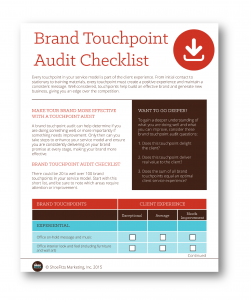 As you move into the New Year, consider an audit of your visual and experiential brand; here’s a starting point: Brand Touchpoint Audit.